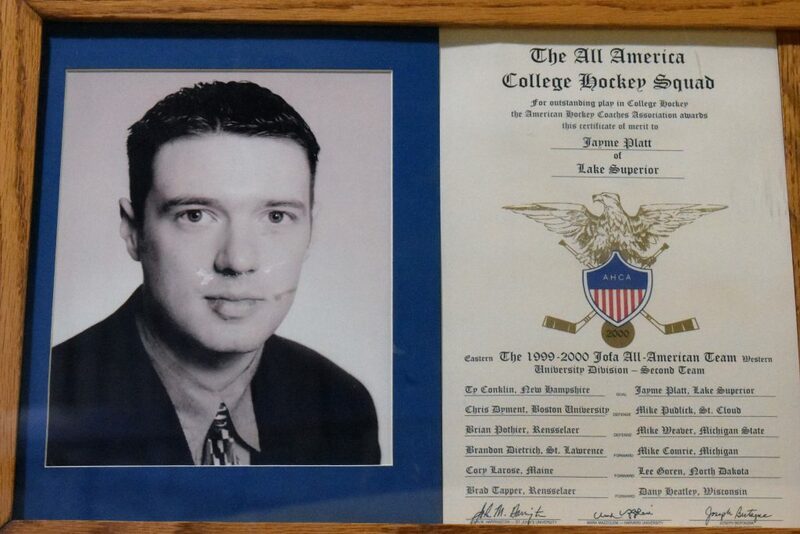 Throughout the course of Laker history, there have been several players named All Americans by the American Hockey Coaches Association (AHCA). 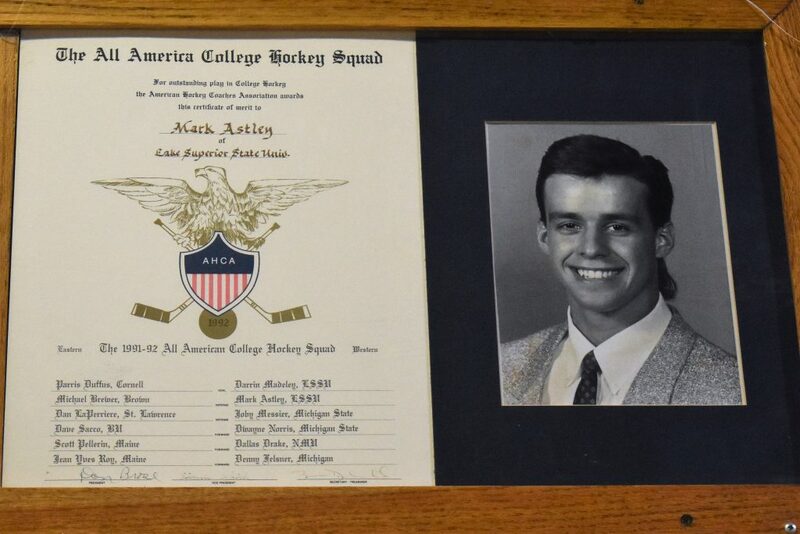 Many of those selections came from during the “glory years” of Laker hockey. There are, however, selections from throughout the existence of the team. Many Lakers from the early years are listed as NAIA All Americans. Due to the difficulty of finding reliable data from that time, they will not be included here until verification of their achievements can be made. 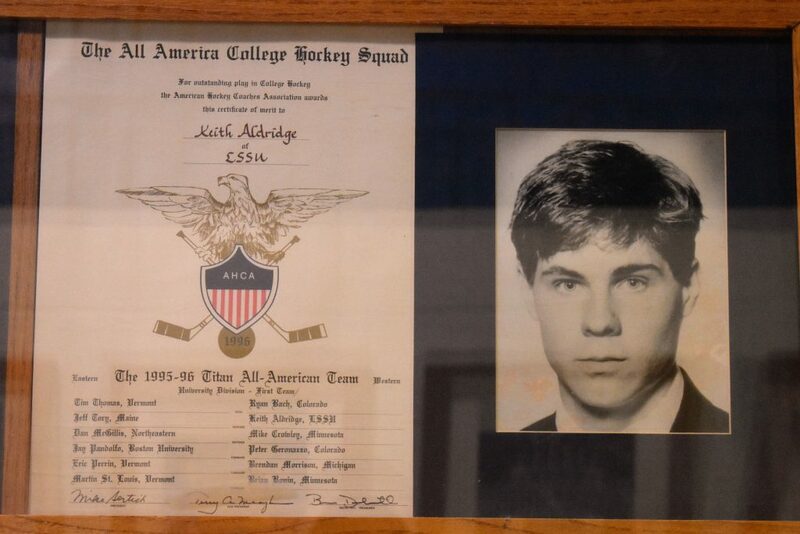 The first recipients of All American honors from Lake Superior were forward Jim Wiley and goaltender Don Muio. Both were honored for their performance in the 1971-72 season (the year the Lakers first won the NAIA National Championship). Muio, a native of Sault Ste. Marie, Ontario, was named team MVP the following season. From 2007-08 to 2010-11, he served as goaltender coach for the Lakers. The season saw Muio collect 17 wins in 22 games, sport a 3.59 goals against average and make 619 saves. Wiley became the first Laker to appear in the NHL when he played 4 games for the Pittsburgh Penguins in the 1972-73 season. He played 62 games over four seasons with the Penguins and Vancouver Canucks. His stat line in 1971-72 read 22 goals and 34 assists for 56 points (highest on the team in each category). 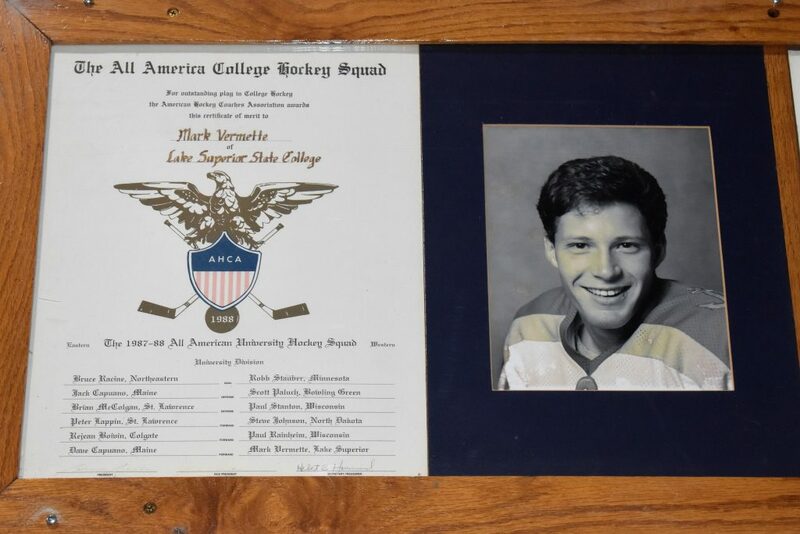 Mark Vermette became the first Laker to be named an All American since the team joined the NCAA in 1974-75. 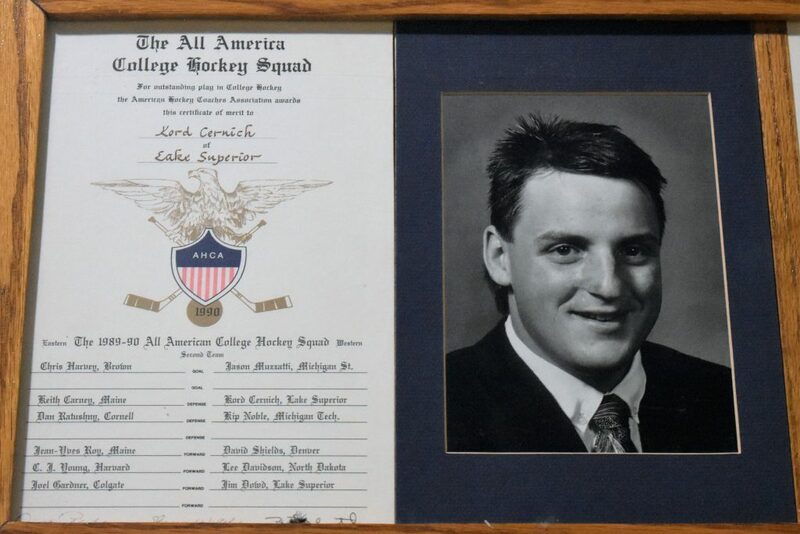 He became the first Laker to be a Hobey Baker Memorial Award finalist, as well as the first named the CCHA Player of the Year. 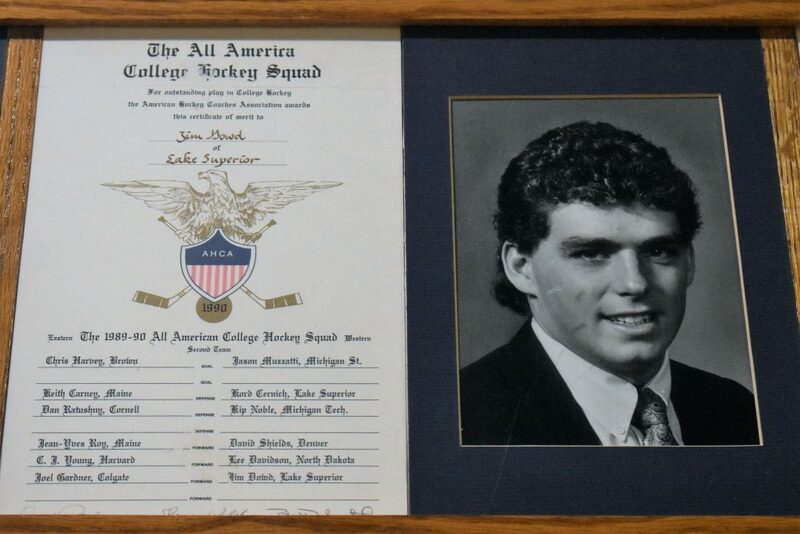 Vermette potted an incredible 45 goals on the year, including perhaps the most famous goal in the history of Laker Hockey – the overtime winner in the 1988 National Championship game against St. Lawrence. Vermette was drafted by the NHL’s Quebec Nordiques and played parts of four seasons with Les Nordiques. Kord Cernich was the first blue liner from the Lakers named to an All American team. The native of Ketchikan, Alaska, played from 1986-87 to 1989-90 with the Lakers, appearing in 177 of a possible 178 games. In 1988-89, Cernich had 7 goals and 31 assists. Serving as an alternate captain in his senior season, Kord Cernich wrapped up a spectacular career with the anchor on his chest with a 11 goal and 25 assist season for coach Frank Anzalone. Following his time in Sault Ste. Marie, Cernich played several years in the AHL and IHL (a direct competitor to the AHL) before spending his final seven professional seasons with the Anchorage Aces in the West Coast Hockey League before retiring in 2001. 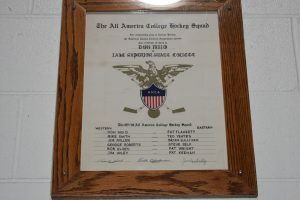 Jim Dowd earned CCHA 1st team honors and was name CCHA player of the year. 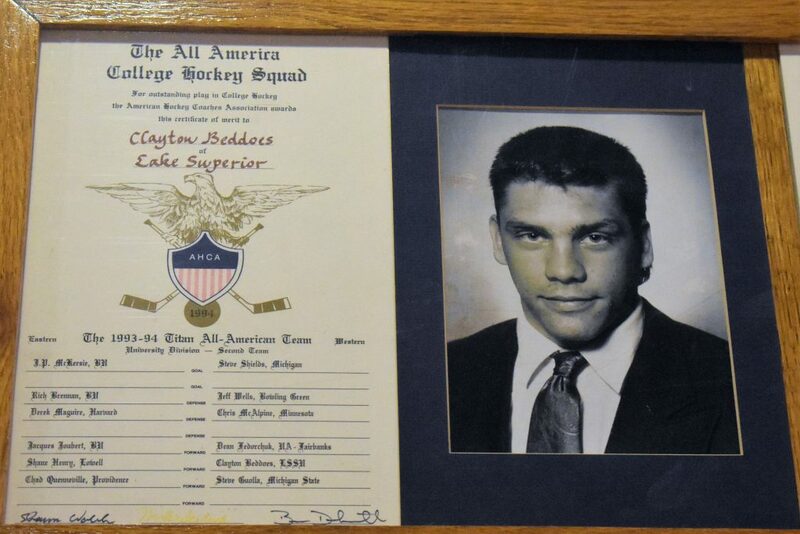 In addition, he was a member of the CCHA All Decade team for the 1990’s. Dowd followed up his 92 point campaign from a year prior by accumulating 75 this season. 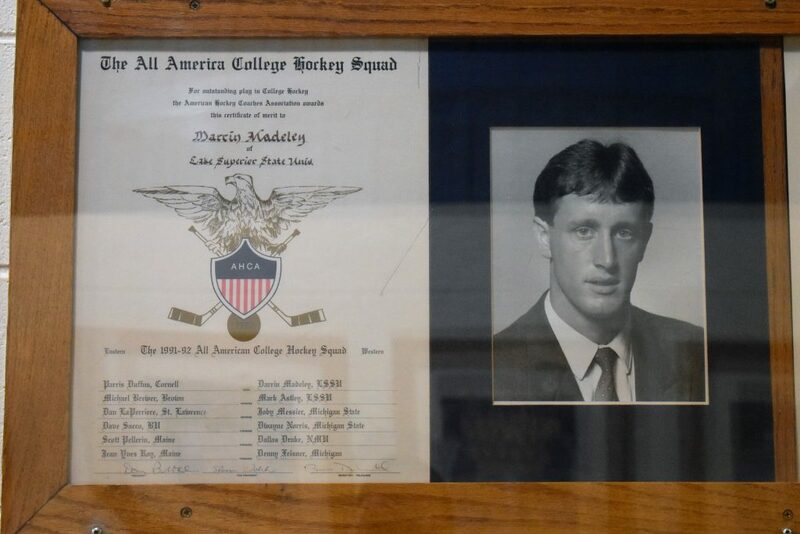 Darrin Madeley was also a CCHA 1st team member. 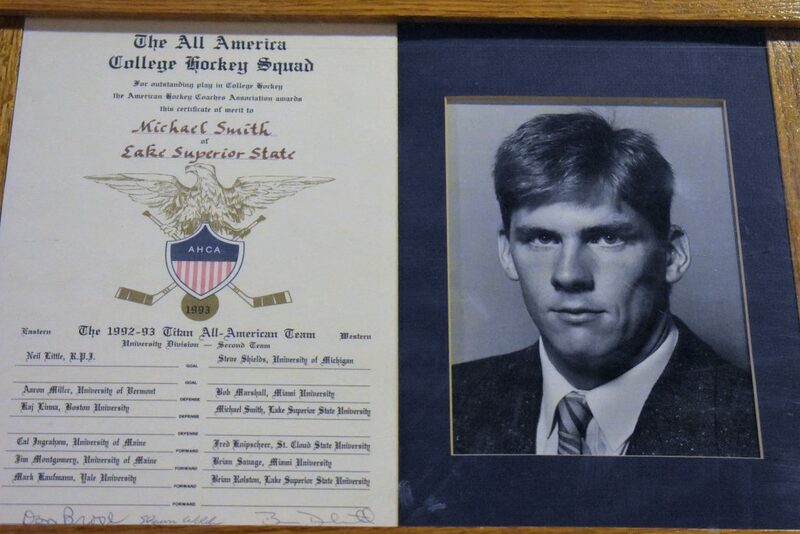 He was inducted into the LSSU Sports Hall of Fame as a player in 2018 (the 1991-92 team is also in the Hall, joining in 2012). During the 1990-91 campaign, he set the school record for wins with 29. The 75 wins he accumulated throughout his Laker career are the most for a goaltender in school history. This season also saw him win 13 consecutive games and go on a 24 game unbeaten streak (21-0-3). 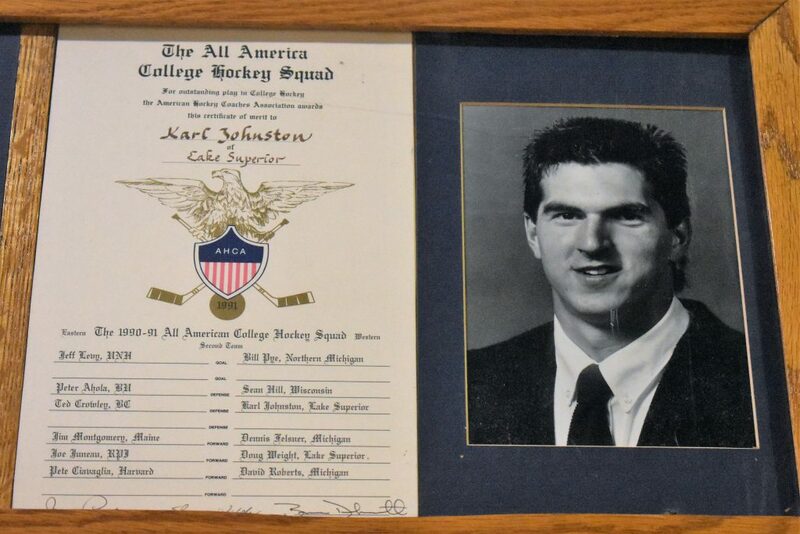 Karl Johnston, a CCHA 1st team member (noticing a pattern yet?) 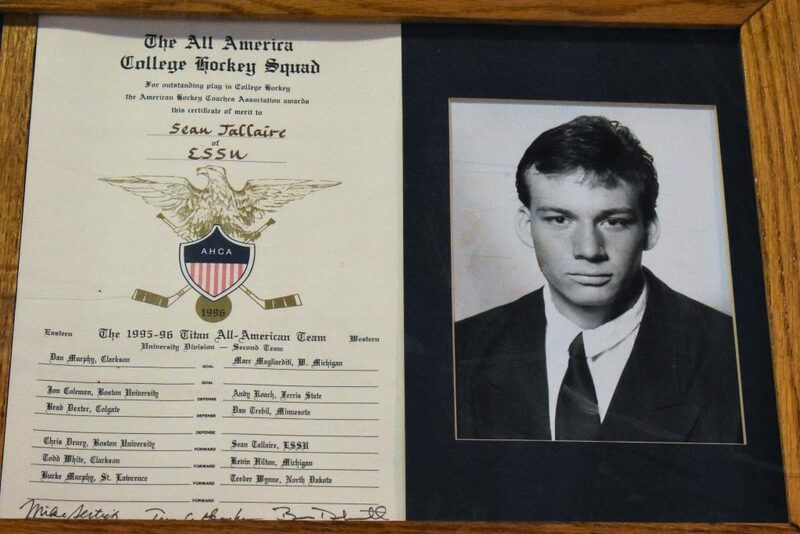 His 45 points in 1990-91 are tied for 5th all time for a defenseman in a single season. Despite the lofty point total, Johnston was recognized by the CCHA as the Best Defensive Defensman. Johnston donned an “A” during his senior season. 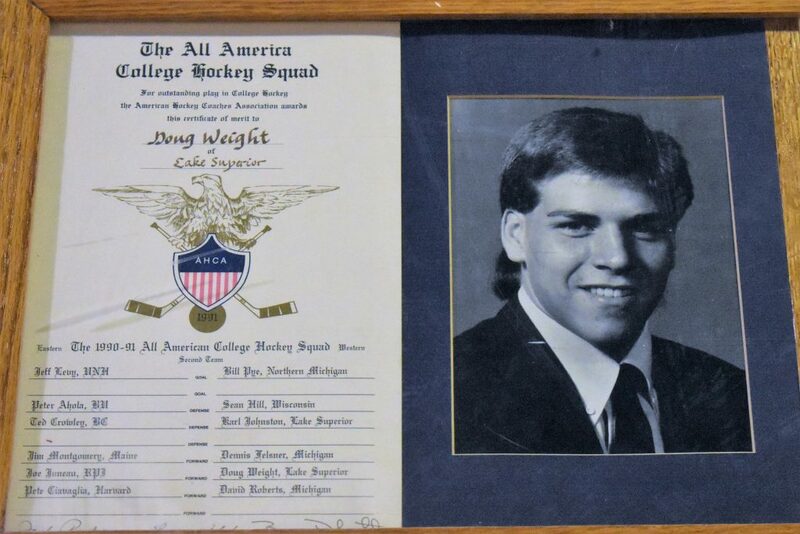 Weight – Like the other All Americans in 1990-91, Weight was a member of the All CCHA 1st Team. In his second (and final) season with the Lakers, Weight amassed 75 points, which is tied for 3rd most in a single season with Mark Vermette (1987-88). Following his time in The Soo, Weight went on to a productive NHL career which saw him win the Stanley Cup in 2006, and have a 100 point season (he had 104 in 1995-96 with the Oilers). 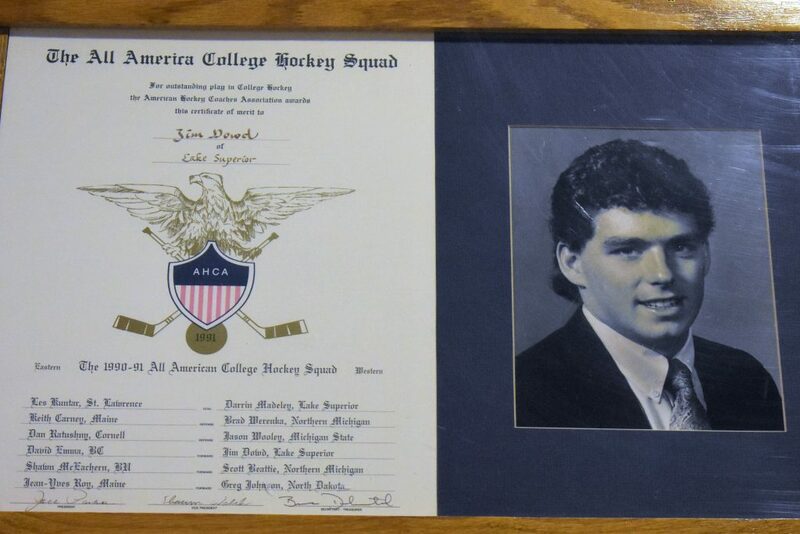 Drafted 34th overall by the New York Rangers in 1990, Weight played for six teams in 20 seasons. In addition, Weight represented the United States in the Olympics three times (1998, 2002 and 2006). Midway thru the 2016-17 season, Weight was named head coach of the New York Islanders, a title he held for 1½ seasons. 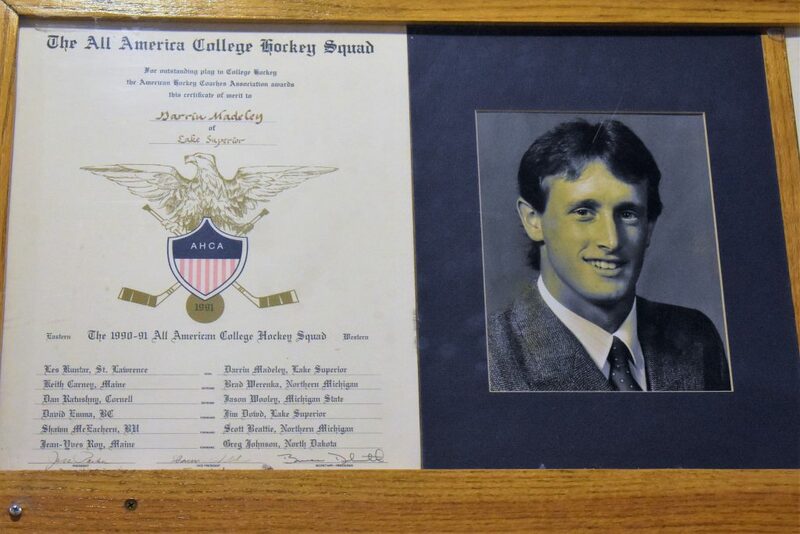 In his junior season, Darrin Madeley led Lake Superior State to its second NCAA title. He had 25 wins, came up with 816 saves and sported a 2.07 GAA — the 2nd lowest in team history. For his efforts in the CCHA Tournament, Madeley was crowned Tournament MVP. 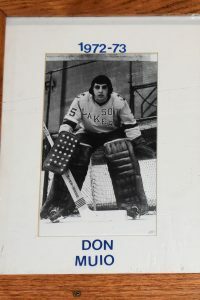 Following his time in a Laker uniform, he was a member of the Ottawa Senators during their inaugural season. 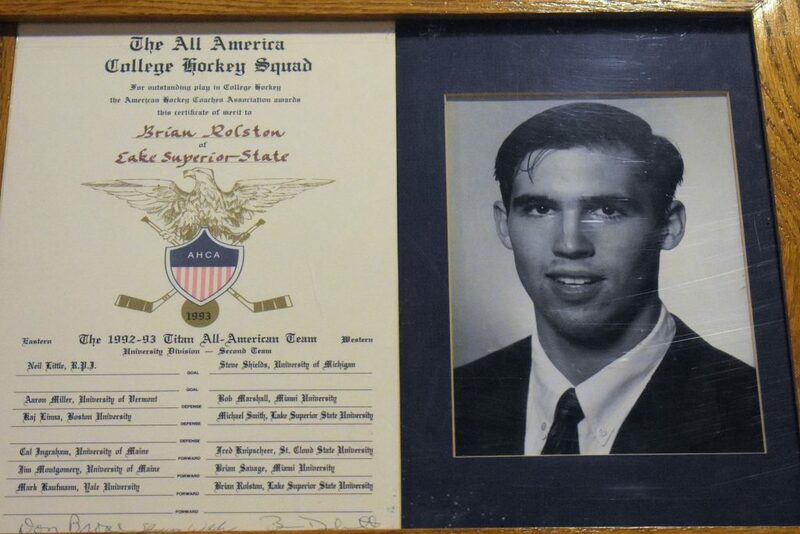 He spent many years playing professionally in the AHL and IHL. A senior, Mark Astley earned a 1st team All American selection. A 10th round pick (194th overall) of the Buffalo Sabres in 1989, Astley served as team captain in 1991-92. His 37 assists in 1991-92 are the most ever for a Laker defenseman. 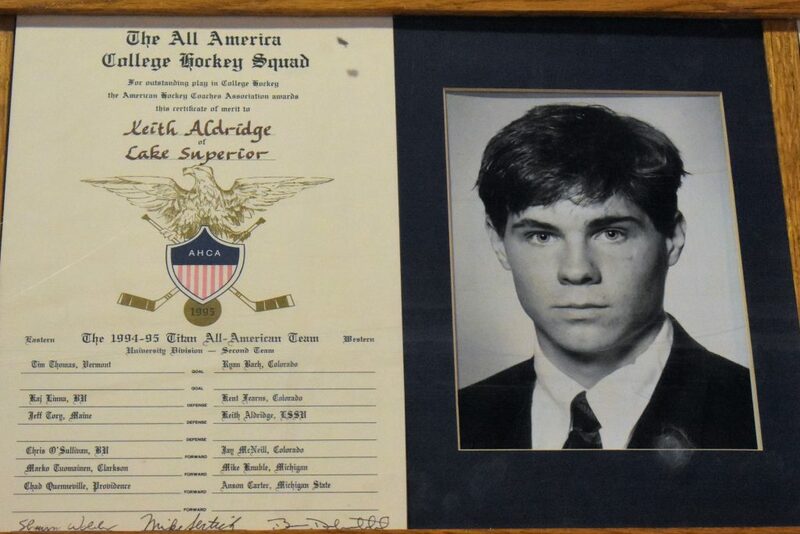 The 49 points accumulated that season rank 6th all time for a defender and helped him be named the CCHA Best Offensive Defenseman. In addition, he represented Team Canada in the 1994 Olympics.